Q: Who is General Plastics? Q: How do I contact General Plastics? Q: Who are your distributors and where are they located? Q: What does your product designation mean and how do I know what the density is? Q: Can I get a sample of the product? Q: Are your foams antibacterial? Q: What types of adhesives can be used on your foam? Q: What kind of tools can I use to cut the material? Q: What aerospace applications are your products used for? Q: Which foams do I use for underwater vs. above water applications? Q: Is the byproduct of these materials such as dust and shavings toxic or harmful? Q: Is your product as easy to process as wood? Q: Do I need to be concerned about tool wear when cutting your material? Q: How well does your product hold up in outdoor environments? Q: I want to paint the material. What steps do I need to take? Q: Does General Plastics offer production services? Q: Does General Plastics require a data file? Q: Can the project be of any volume or size? Q: What testing services does General Plastics have to offer? Q: What’s the turnaround time for receiving the test results? Q: What is your minimum purchase requirement? Q: What are the preferred file types for submitting an RFQ? Q: What are your standard sizes for Rigid Foam? General Plastics Manufacturing Company has been a leading innovator in the plastics industry for more than 70 years. 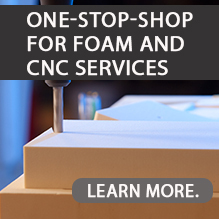 The company develops and manufactures rigid and flexible polyurethane foam products, which include its signature LAST-A-FOAM® brand series and build-to-print composite parts.We are certified to ISO 9001:2015/AS9100D and meet the rigorous demands NQA-1, Mil-I-45208A and Boeing Company D6-82479. For customer service and general product and service information, call our Customer Solutions Team at 866-825-1378, email sales@generalplastics.com or send us a message online. General Plastics has a multitude of distributors across the United States and several international distributors including China and South Africa. For a complete list, visit our distributor page. The first two digits in our product designation specify the product series. The last two digits specify the density. For example, FR-3804 refers to our FR-3800 FST/OSU product series with a density of 4 lbs. per cubic feet. Yes, we offer a variety of samples ranging from composite core to aerospace kits. For a full list, visit our sample page and request the sample kits that are best suited for your applications. Our foams are bacteriostatic in that they do not promote or support microbial growth. Most bonding agents work well with our products: epoxy, contact, polyurethane, and cyanoacrylate. See our tooling user guide for a full list of recommended products. For densities less than 10 pcf, you can use hand or power tools. For anything above, we recommend using power tools, CNC routers or milling machines. For more than 60 years, we have been serving the global aerospace industry with our FR-3700, FR-3800 FST, and FR-6700 composite core materials used for edge closeouts, sandwich panels, and other various interior components. We specialize in built-to-print molded parts and gap seals for aircraft interiors and flight decks. For more information, visit our aerospace market page. For underwater applications, we recommend our R-3300 subsea foam that provides buoyancy to depths of 1,200 ft., uncoated or 2,400 ft. coated. Our TR-Marine foam is primarily used for above water applications such as transoms, decks, and coolers. No. The polyurethane has been fully reacted and is chemically inert in its final stage. Appropriate precautions (masks/goggles) are recommended when working with these materials. Our products are easier to machine than wood as there are no knots and polyurethane is grain-free, ensuring an even cut in all directions. Our material cuts very easily resulting in little tool wear. Like wood products, tool speed and feed rates need to be adjusted accordingly to suit the various densities of materials. Foam materials should be cut dry with no cooling or cutting fluids used. Refer to our Tooling User Guide for more information. Due to their fine, closed-cell structure, water cannot permeate our rigid materials meaning there are no cracks or bowing from water saturation. Our foam does not rot or decay. For the best finish, seal and prime the material before painting. Higher density products typically do not need to be sealed due to their smoother finish. Refer to our Tooling User Guide for recommended products. From quality assurance to on-time delivery, General Plastics’ production services include machining, molding, fabricating, laminates, thermoforming, bonding, and assembly. Visit our production service page for more. While we can work from an adequately dimensioned part drawing or reengineer it from a sample part, a data file is preferred. Our production services can work with any size project you have, from one-off tools and parts to large-scale projects. Our facilities have large routers for large projects and CNC milling machines for intricate details and production work. Our FAA-Certified testing facility offers flammability and physical property testing services. For more information, visit our Testing Services page. For flammability testing services, we are one of nine labs in the nation that offer the Seat Oil Burner Flammability Test. Beginning January 1st, 2019 our minimum purchase amount is $1,500. All of our products are custom cut to thickness and pricing is based on a multitude of factors including quantity, size, and labor. Please contact our Customer Solutions Team for other related inquiries at 866.825.1378. For estimating, we accept STEP, IGES, and Solidworks, Parasolid, AutoCAD, and CATIA file types. While size varies from product and density, we can do custom sizes that best fit your needs. General Plastics offer large buns up to 24″ thickness, 60″ wide and 120″ in length. Please visit our product page for specific sizes. For sheet stock items, our standard lead time to ship is 7 days after acceptance of order. Please allow appropriate time for shipping. We will work with customers on a case-by-case situation if a shorter lead time is required. Please contact us at 866.825.1378 for more information.